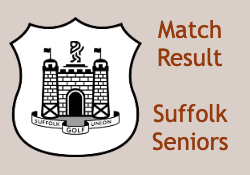 Suffolk Seniors entertained Kent Seniors, in an annual friendly fixture, at Ipswich Golf Club on Thursday 4th April.Kent fielded an extremely strong team with two plus and two scratch handicappers and ran out winners by a margin of 9 points to 1. Suffolk's only winner being Graham Shillings who beat Gary Croucher 1 up. Please click here to view full results.